Is the Paula Deen side of you wondering how you could ever get by without butter as a vegan? Have no fear -- vegan butter not only exists, but it’s easy to find and delicious! You won’t miss the cruelty! The most popular vegan butter on the market is made by Earth Balance. They have a long line of buttery products. Their buttery spread comes in tubs and sticks. There are several options with the buttery spreads: Original blend; Whipped (perfect for spreading on breads and muffins and the like); Soy Garden, made with the power of soy; Olive Oil blend; and Soy Free, for those avoiding soy. Earth Balance also makes buttery sticks, available in their Original blend, and Natural Vegetable Shortening sticks. You can learn about all of their products on their website. You can also find recipes and health facts for their products. Certain Smart Balance spreads are vegan, but it’s important to read the label, as some of their products contain fish and gelatin. The vegan tubs usually have the word “vegan” printed on the packaging. Their Light Original Buttery Spread with Flax and their Organic Whipped Buttery Spread is vegan. Visit their website for more information (and coupons!). 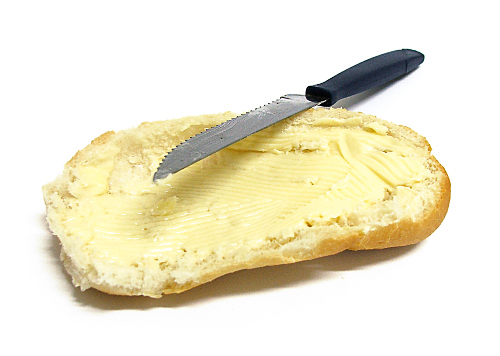 There are plenty of recipes floating around the Internet for making your own butter at home. This post from VeganBaking.net is a wealth of information on all things butter, and includes several different recipes for vegan butter. This one from Adventures of a Gluten-Free Mom is great for anyone looking for a dairy-free, corn-free, and soy-free spread. She adapted a recipe from the aforementioned VeganBaking post. Vegangster, seeking a palm oil-free vegan buttery spread, came up with this earth-friendly recipe for Futter – faux butter! Clearly there are many options for buttery goodness while adopting a vegan lifestyle. With its health benefits and lack of involvement in the cruel dairy industry, we can all agree that vegan butter is better butter! Tampa Bay, FL Amanda stopped eating meat in 1995, the moment she learned what meat was: dead animals. She was 11 years old. Her passion for vegetarianism and animals grew as she did and she eventually went vegan in 2004. Amanda blogs at Hungry Vegan Traveler, posting about vegan eats she encounters everywhere she goes, near and far. Amanda currently resides in the Tampa Bay, Florida area. She works full-time with at-risk youth and is also an active volunteer for animal and human causes.